Advertising should be free of invalid activity – including unauthorized, misrepresented, and fake ad inventory – which diverts revenue from legitimate publishers and tricks marketers into wasting their money. 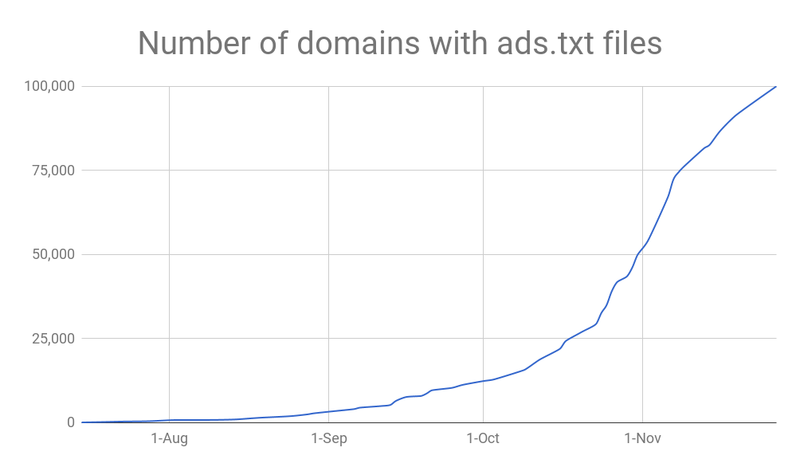 Earlier this year we worked with the IAB Tech Lab to create the ads.txt standard, a simple solution to help stop bad actors from selling unauthorized inventory across the industry. Since then, we’ve shared our plans to integrate the standard into our advertiser and publisher advertising platforms. Marketers and agencies using DoubleClick Bid Manager and AdWords will not buy unauthorized impressions as identified by publishers’ ads.txt files. DoubleClick Ad Exchange and AdSense publishers that use ads.txt are protected against unauthorized inventory being sold in our auctions. Preventing the sale of unauthorized inventory depends on having complete and accurate ads.txt information. So, to make sure our systems are filtering traffic as accurately as possible, we built an ads.txt crawler based on concepts used in our search index technology. It scans all active sites across our network daily, over 30m domains, for ads.txt files, to prevent unauthorized inventory from entering our systems. We believe ads.txt is a significant step in cleaning up bad inventory and it's great to have the broad support of our partners like L’Oreal, Omnicom Media Group, and the Financial Times. "Removing counterfeit inventory from the ecosystem is critical to maintaining trust in digital. The simple act of publishing an ads.txt file helps provide the transparency we need to quickly reduce counterfeit inventory from harming our clients." “It's great to see adoption of ads.txt across the industry and we're happy to see Google put their support behind this initiative. By eliminating counterfeit inventory from the ecosystem, marketers' budgets will work that much harder and revenue will reach real working media to fund the independent, high-quality journalism which society depends upon." It’s amazing to see how fast the industry is adopting ads.txt, but there is still more to be done. Supporting industry initiatives like ads.txt is critical to maintaining the health of the digital advertising ecosystem. That’s why we’ll continue to invest and innovate to make the ecosystem more valuable, transparent, and trusted for everyone. With the all important holiday shopping season about to begin, you can’t afford to miss any revenue opportunity. But you also need to be careful about how much you push your already stretched team. This is why we recently introduced three new tools, available to all DoubleClick Bid Manager accounts, that will help you reach more consumers while reducing manual work. First, as part of the new planning workflow in DoubleClick Bid Manager, we recently launched a new campaign object that lets you group Insertion Orders (IOs), so you can more efficiently manage your ad buys. For example, this will help you improve the reach of your campaign by allowing you to set up frequency capping across Programmatic Direct deals and open auction IOs, so you can be sure that your open auction campaigns reach consumers who haven’t been already exposed to your ads. You can create a new campaign in just a few simple steps*. Second, we have introduced a slider that lets you expand your similar audience lists* so you can choose if you want maximum reach, higher similarity or a balance of the two. For example if you’re a toy retailer, your sales during the holiday season are likely going to be critical in determining your success for the entire year. To capture the increased holiday demand, you can use the slider to choose to reach the most possible consumers who look like your frequent purchasers. Once the sales peak has passed, you can scale your similar audience campaigns back to focus on more similarity. You can find the new expansion slider in the Audience lists targeting tab of your line item level settings. By following the steps above, you can improve the setup of your campaigns and give them the best chance of success, but once your campaigns are up and running, you need a fast way to spot if things are not going according to plan. To help you with this, we recently introduced a new optimization view that allows you to quickly focus on campaigns that are not on track to achieve their spend and performance goals. Once you know where you should focus your attention, you’ll be able to quickly determine what is driving the poor performance. By segmenting the data along dimensions (site, time of day, day of week, environment and more), you can easily see what is impacting performance. In addition to surfacing key insights, the optimization view also provides suggestions on how you could optimize Line Item budgets within an IO. This way you can spend time making strategic decisions and not calculating how you should re-allocate budget across different Line Items. "The optimization view has been helping us get quick insights, such as top performing placements and times of day. With this information we can immediately change our strategies to boost campaign performance without having to manually pull reports." You can access the new optimization view* at the IO or Line Item level by selecting Optimization from the drop down menu next to the New Insertion Order or New Line Item buttons in the DoubleClick Bid Manager. *A DoubleClick Bid Manager account is required to visualize the article.